Combine these together in a large saucepan over medium heat and stir until the sugar dissolves. Continue to cook the sugar without stirring until it reaches soft-crack stage (270 F). Taffy can be cooked slightly less to hard-ball stage (260 F), if desired. Candy cooked to soft-crack will be brittle and hard, while candy cooked to hard-ball will be slightly softer and stickier. 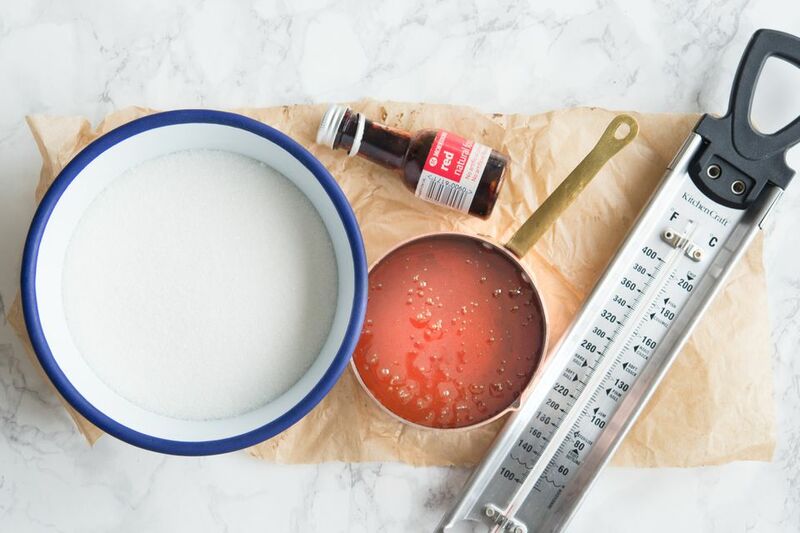 Once the candy has reached the desired temperature, remove from the heat and immediately stir in any desired flavored extracts and food colors. For this recipe, a 1/2 teaspoon of flavored extract and 3 to 4 drops of food coloring should be enough. Feel free to experiment with various flavor and color combinations. If you're making multiple hues from the same batch, remember to divide up the syrup before adding the colors. Place any syrup you will not be pulling immediately on a baking sheet in a 200 F oven so it remains warm and pliable. Pour the syrup from the pan onto a cool, oiled work surface. A marble slab or heat-safe cutting board works perfectly. Allow the syrup to sit and cool for a minute until a skin has formed on the surface. With an oiled metal ​bench scraper or metal spatula, begin to work the syrup by folding the edges into the center. Continue turning and working the syrup until it is just cool enough to handle. Pulling and stretching the candy is intrinsic to the texture of taffy, but it can be dangerous. Be very careful not to burn yourself when pulling taffy. Do not handle the candy until it is cool enough to touch, and beware that candy that feels cool on the surface can be burning hot underneath. Wear a pair of food-safe gloves (or two) while pulling candy to prevent burns and overheating. If you do not wear gloves, make sure your hands are well-oiled so the sugar will not stick to and burn your skin. To begin pulling the candy, lift it from the work surface with an oiled scraper or spatula and push it into a cylinder. Stretch it between your hands. It will be soft and will sag in the middle. Bring the syrup back together and again stretch it out between your hands. Repeat until the syrup begins to hold its shape when stretched out. Begin working the syrup with a twisting motion. Fold the pulled, twisted syrup together into a horseshoe shape. Twist the two halves together, working evenly and firmly. Pull the twisted syrup to make a long, even rope about 1/2 inch in diameter. Continue to repeat the folding, twisting, and pulling pattern as long as the syrup is supple. You will notice that it will get firmer and the texture changes to glossy, pearly, and opaque. When the syrup has reached a point where it is becoming difficult to pull, fold it in two and then fold it again, creating a four-strand horseshoe design. Gently twist the strands together. Pull the four-strand candy one final time, gently twisting as you pull, to make a long, thin, and even rope. Use oiled kitchen shears or scissors to cut the candy rope into short pieces of equal size. Allow them to dry and harden completely at room temperature. 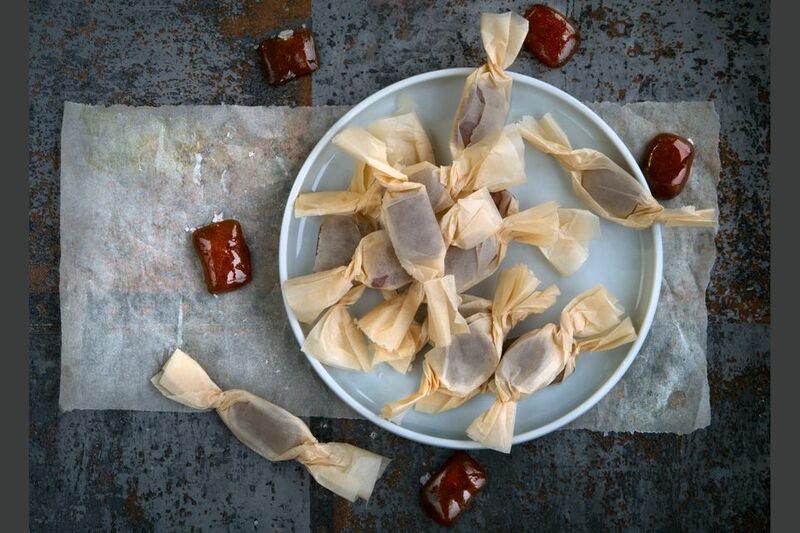 If the candies won’t be served immediately, wrap them individually in waxed paper to prevent them from sticking together. Store in a cool, dry place.